Have you thought about winning some of your holiday gifts this year? This is one of the ways I've been making my holiday budget stretch farther for several years now. I enter blog giveaways and contests on a daily basis in hopes of winning. Some of them I enter because they are perfect for my family and others I enter because they will make the perfect gift for a friend or family member on my holiday shopping list. Now is the perfect time to start thinking about your holiday gift shopping. It doesn't get any more frugal than FREE! 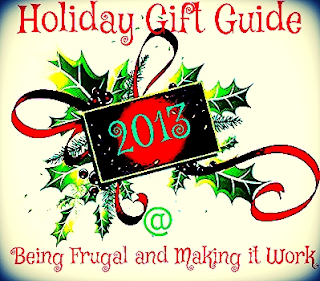 Be sure to check back often, because new holiday gift guide giveaways are going to be posted on a regular basis! What items are on your holiday gift list this year? You have a great giveaway guide. Thank you for your great ideas. I would love the Rockboard Scooter! This looks like you have exciting things to come. I think you are off to a great start! I think I enter more giveaways at this time of year just because I hope to keep Christmas spending down. Thank you for the one stop place to enter. Thanks for the great list of giveaways. Will keep checking back to enter. What a good way to start organizing the awesome promos that are going to go on for the holidays! Like this list! Hope to see more good updates! I hope to be lucky this year and win some giveaways! Great giveaways!! Your winners are going to have a great holiday! Entered a couple of these, great giveaways thanks! I spy two different chocolate prizes! You know what.... I haven't even given much thought to my own list yet this year! I'll have to keep an eye on what you post and hopefully it'll inspire me. I am proud of myself for already having a few Christmas gifts ready to be wrapped. I love the recommendation of the candle warmers. Good idea!